When is the Fortnite season 8 release date? Season 7 of the unfathomably popular battle royale game has flown by in a haze of seasonal events? Whether you’ve been trying to tick off as many battle pass and weekly challenges as possible to unlock some new Fortnite skins, or racking up Victory Royales with all the new gadgets and weapons added over the past few weeks – it’s been tricky just keeping up with Epic Games recently. But, as ever, we’re already getting excited about what’s coming next: Fortnite season 8. A new season of what is officially the biggest free PC game in the world comes every two-and-a-half months or so; we basically get to celebrate gaming Christmas multiple times a year. If the next Fortnite season is like anything those before it, expect a raft of changes to that island of death we’ve spent countless hours sneaking and blasting through, plus a brand new theme, items, and a Battle Pass packed with cosmetic goodies like Fortnite wraps and emotes. So, what can we expect from the new Fortnite season? Many theories as to what the next phase of Epic’s battle royale game will hold are already widespread across the internet, helped on by the cheeky teases and secrets hidden away in the map. We’re going to be breaking them all down to give you an idea of how different Fortnite will be when the upcoming season releases. Here’s everything we know about Fortnite season 8. The Fortnite season 8 release date is February 28, 2019. That comes two weeks after the tenth week of normal challenges, but Epic are helping us get through as much of the Battle Pass as possible with two double XP weekends. There are also some bonus challenges as part of the Fortnite Share the Love event: the Overtime challenges. Typically a new season kicks off with a hefty bit of server downtime. And, as with previous years, servers will be offline before the Fortnite season 8 release time at 9am (4am ET / 1am PT) and last for probably under an hour. Of course, this could be longer or shorter depending on the size of the update, any back end nightmares on Epic’s side, and your internet connection, so we’ll have to wait and see on that front. We have already got more overhauls to our favourite battle royale arena than we expected in season 7. First, a frosty iceberg biome blanketed the map’s south-west in snow heralding the entry of three new named locations: Frosty Flights, Polar Peak, and Happy Hamlets. But more was to come; what was thought to be a series of Cube-related clues as to the upcoming Fortnite season 8 map changes turned out to be a mid-season overhaul. 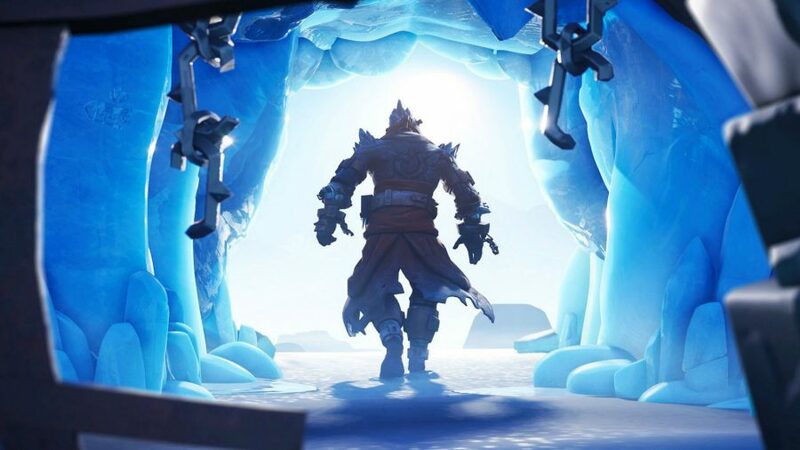 Once players found the Ice King inside a giant ice ball, a mysterious chap who smothered the entire map in snow as part of the Fortnite Ice Storm event. So what Fortnite map changes will there be? Well, our best bet will focus on all the ice that’s covered the map – it’s got to melt eventually. A strong theory centres around raised water levels transforming the world into a watery paradise. There is that huge Fortnite submarine, after all. Also, we’ve had planes and carts, so it’s certainly feasible that we’ll be sailing ships across the map in season 8. Of course, the snow could get worse, just in time for the start of another eighth season: that of Game of Thrones. The TV adaptation of George R. R. Martin’s fantasy epic is set to start its final series on 14 April – which falls within the time frame of the upcoming Fortnite season – and there’s a chance that there could be some overlap. The Ice King looks an awful lot like the Night King, as do the Ice Fiends to the White Walkers. We already know Fortnite is big enough to enjoy crossovers with Marvel as we saw in the Fortnite Thanos event. Even if this is just a nerdy pipe dream, the fantastical clues are there in the map. The dragon eggs tucked away beneath Polar Peak castle must surely serve some purpose. 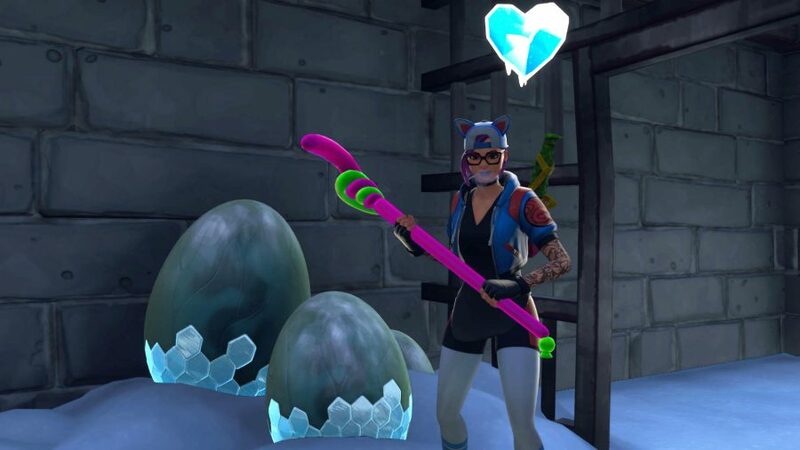 Perhaps ice-breathing dragons will hatch with a damage-over-time health bar, as we saw with the big iceberg that appeared near Flush Factory. It would be cool to take part in a battle against massive dragons as they lay waste to the map. Either way, we’re looking forward to seeing how the battle against the Ice King intensifies. Adding lore fuel to the fire is the Prisoner skin found in the files behind patch 7.3. This mysterious figure is your reward for completing seven weeks of Fortnite Snowfall challenges. His chained arm appears to match that of the one found in the ice in Polar Peak, and it appears as if he will be playing a central role in Fortnite season 8. He has escaped now, but little is still known about his story yet. You can see him appearing to break free from his chilly prison in the loading screen above (leaked by @lucas7yoshi_). Another season, another chapter in Epic’s premium progression system. We’d be willing to bet our posh Snobby Shores abode that there will be a brand new Fortnite season 8 Battle Pass. That means another ten weeks of challenges and 100 tiers full of new Fortnite skins and other cosmetic loot. If you’re new to the game, you can get a taste of the kinds of treats you’ll be able to acquire through the Battle Pass in the video above. Last season we could try on new weapon and vehicle skins, Fortnite Wraps. We’re not sure if there’ll be another new type of unlockable this time, but we’ll certainly be rolling in cool new gear as we battle through each tier. What we do most likely know is the Fortnite Battle Pass cost. For 950 Fortnite V-Bucks you’ll be able to get in on the action all over again. Provided there isn’t a price bump, 1000 should cost you £7.99/$9.99. Chances are that’s all you need to spend to access the premium and seasonal challenges and 100 new Battle Pass tiers for the next ten weeks. 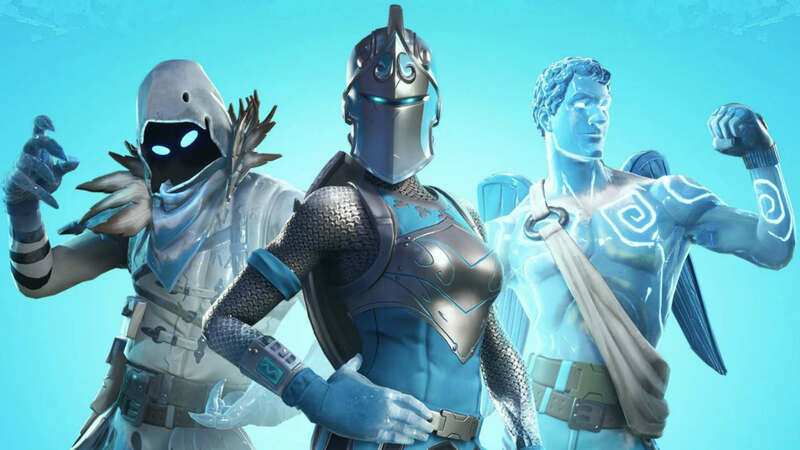 Plenty of players will be curious to see what the Fortnite season 8 theme is, since it tends to set the aesthetic trend for the types of skins we’ll be able to purchase or unlock through the game’s progression system. Theories around a potential Game of Thrones tie-in abound, but if we know anything about Epic Games, we’ll be in for some surprises. Last season saw the snow theme take hold across the map, but undoubtedly it will reflect the unravelling metanarrative involving the Ice King and whatever happens with those Polar Peak dragon eggs. The possibility of the ice caps melting could well introduce an aquatic theme full of boats and maybe a new Atlantis-style named area. Fortnite has been getting darker and darker over the past few seasons, so it would be good to see Epic Games introduce a brighter theme for Fortnite season 8. And that’s everything we know about Fortnite season 8. We don’t know about you, but we’re itching to see how Epic will revolutionise the genre all over again. While you’re waiting, make sure you’ve caught up on all of your weekly challenges – they’ll be wiped for good once the upcoming season commences. So, make sure you’ve launched enough Fortnite fireworks and completed your Fortnite search between three ski lodges, for example. For now, we’re, er, continuing our research by re-watching every episode of Game of Thrones.